Taking a very long five years after the release of 2010's The Epigenesis, Melechesh ('king of fire') have returned with album number six, and as expected, it's terrific. Melding the blackened thrash of Absu with the ethnic sounds of the band's Middle-Eastern roots, the band have long ploughed their own field and long done it well, but I can't remember falling in love so quickly with any of their previous albums. They are all terrific, of course (barring début As Jerusalem Burns...) but so confident and assured is Enki that it's impossible to resist. If the band have a star-making moment that should propel them into the metal mainstream, this is it; a great set of songs that are metal to the core but with an original aesthetic that will make them stand out from the crowd. Worriers will focus on the 'metal mainstream' part of that, of course, and it's not hard to hear that the black metal elements of the band's original sound have reduced. 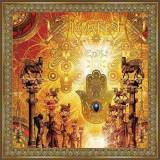 Yet this is no Orphaned Land-esque weakening; Melechesh still pack an aural punch, just one that has been redirected. Opener Tempest Temper Enlil Enraged allows barely forty seconds of build-up before launching into pulverising Arabian thrash, widdly melodic guitar lines snaking across a powerful and solid metallic base – and the song still hasn't begun properly, the band teasing mercilessly with another build-up before kicking things off with melodic yet heavy thrashing, catchy and infectious riffing driving the song onwards. Perhaps at six minutes plus it's a little long (especially on an album that is over an hour) but the following The Pendulum Speaks soon chases such thoughts away with another catchy riff, groovy rather than thrashing but intense and enjoyable all the same. It's infectious enough to make for a hell of a first single, and will dazzle those who are new to the band, but is clearly nothing remotely like what you'd hear on the radio. Even a Max Cavalera cameo on Lost Tribes feels completely natural – you wouldn't have known he was there without being told. What becomes clear is that Melechesh are at the point of their career (and arguably have been for years now) where they are good enough to make excellent metal albums naturally. The aforementioned Lost Tribes is a great showcase for the band's sound, brutal thrashing combining with slower moments and even instrumental showcases, all coloured with the Middle-Eastern elements, even the guitar solo. Mid-album potential-fillers like Multiple Truths and Metatron and Man are solid, and although the title track feels a little Behemoth-ic at moments, that the band have two eight-minute and a twelve-minute epics is impressive. That they're all terrific is even more so, using the ethnic elements well (especially in Doorways to Irkala, which is essentially a long interlude) and The Outsiders moving from prog-tinged meandering to ending on a furious black/death flurry. A more than solid album, Melechesh impress yet again.